That was the sentiment heard echoing throughout town Monday after yet another heavy rain caused widespread basement flooding. The city was first hit with a record-breaking rainfall on Aug. 11 that also caused massive flooding throughout the metro area. Another storm hit two weeks ago that, although not as heavy, still caused a limited amount of flooding. And then on this past Monday, a very heavy rainstorm swept through the area, causing dozens of basements here to backup with foul sewer water. Stanley Dyksinski was looking for something to blame for the most recent flood. To a certain degree he’s right. The city failed to connect to a super-sized sewer line that runs along Conant back in the 1950s. But that, technically, was the fault of voters who rejected a special tax to make that connection. 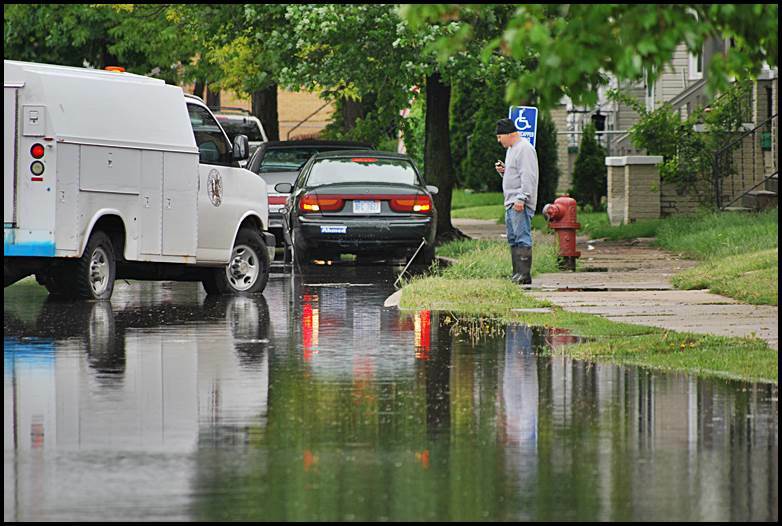 While Hamtramck has always had flooding issues, Mayor Karen Majewski raised a concern about the increasing number of floods. There has also been some chatter on Facebook among locals saying that one way to lessen the problem is to plant more trees. Trees indeed soak up rainwater, and Hamtramck has lost many trees in recent years. Last summer, the city starting cutting down trees whose roots had uplifted sidewalk slabs, but that project was abruptly halted when a number of residents complained about losing their shade trees. Another source of the problem could be backed up catch basins. But Emergency Manager Cathy Square said the basins have been maintained during the year.